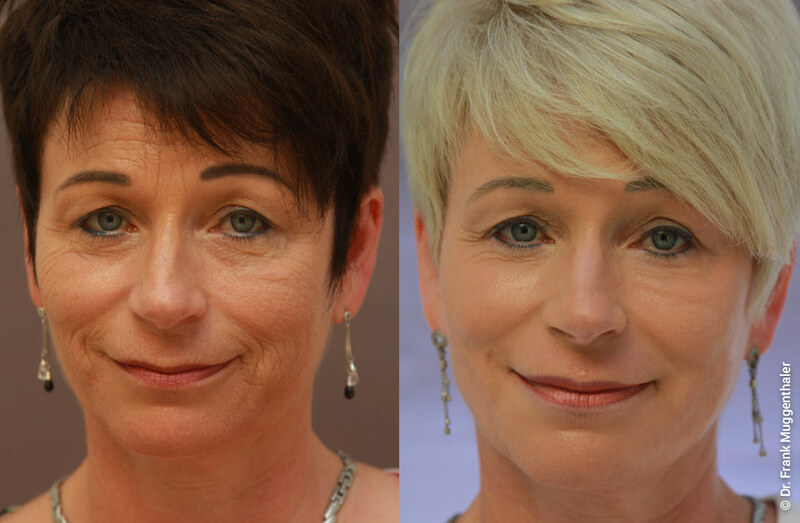 With their variety and above all their different intensities, peels open up very individual treatment options. Medical phenolic peels also achieve deeper skin structures and thus provide an impressive tightening and lifting effect. The special feature of a phenol deep peel is the renewal of the elastic and collagen fibres at depth, which gives the skin a significant improvement in its functional properties. Thus, renewal and rejuvenation take place in all layers of the skin. Not only fine superficial, but also deep wrinkles are almost completely eliminated. The phenol peeling is equal to a surgical lift, if not clearly superior. The special feature is: The natural facial expression is maintained. After 24 hours the tape bandage is removed and a powder mask is applied. Depending on the extent of treatment, we recommend a break of 10 days to 3 weeks. For Muggenthaler Ästhetik we exclusively use products from Skintech and ZO® Skin Health Inc. While fruit acids are more likely to be used for superficial and trichloroacetic acids for medium peels, a phenol peeling causes a complete renewal and rejuvenation of facial skin. By the phenol deep peeling according to Dr. med. Muggenthalerr, deep wrinkles on the cheeks were also completely smoothed. The entire facial skin becomes more elastic and fresher. 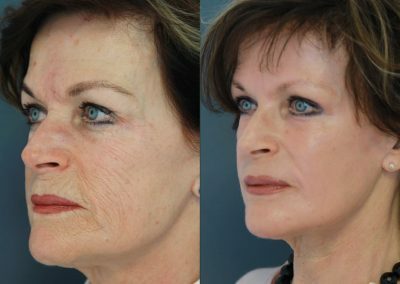 Six months after the phenol deep peelling according to Dr. Muggenthaler, almost all disturbing wrinkles are completely smoothed. The face looks harmoniously “naturally” lifted. 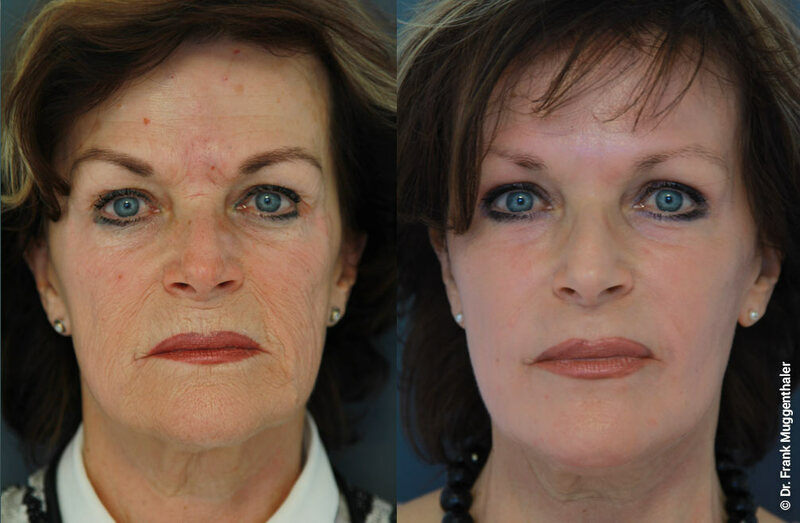 Six weeks after a face lift and a deep phenol peeling of the mouth area and the lower eyelids. 12 months after the phenol deep peeling according to Dr. med. Muggenthaler: The skin appears youthful and is visibly smoothed. Through the deep peeling, the wrinkles in the cheek and mouth were completely smoothed. 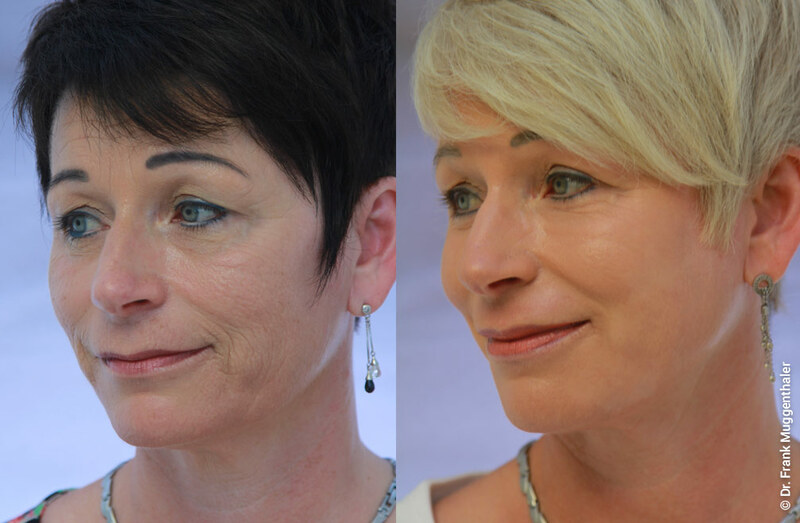 At the beginning of each treatment is a comprehensive consultation and facial analysis. This then results in an individual treatment plan. We recommend a phenol peeling if the facial skin shows a significant loss of elasticity, wrinkles and other signs of aging. In order to guarantee an optimal healing process, a pre-treatment of the skin over at least four to six weeks is necessary. The following goals are pursued: optimal cleansing, correction of skin irritations, reduction of pigmentation disorders and stimulation of skin renewal. These goals can be achieved by special highly effective washing gels, antioxidants, bleaching agents and retinol-containing creams. At the same time, effective sun protection must be taken into account. The phenol deep peeling is carried out under twilight sleep anaesthesia – so you are protected during the approx. The treatment lasts one hour and does not cause any pain. The intensity of Dr. Muggenthaler precisely matches the needs of your facial skin. Finally, a bandage is applied for a particularly even effect. After the treatment, you will spend the night in the clinic, where you will be attentively cared for by our experienced staff. The next morning the bandage is removed and a powder mask is applied. At this time, the face is usually still very swollen, which is why you should rest for a week. For a complete facial treatment we recommend a stay of up to one week in our clinic. The powder mask can be removed one week after the peeling and reveals the rejuvenated and still reddened facial skin. After two weeks, most of the swelling has subsided and any remaining redness can be concealed with make-up. Plan two to three weeks off before you become socially active again. After six to eight weeks, most of the redness is completely gone or only occurs occasionally. The healing process is completed after about six months. During this time, the skin tightens and renews itself again significantly. Effective sunscreen is a must during and after healing. 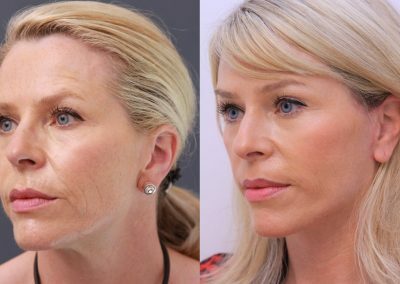 From gentle or moderate skin optimisation to comprehensive skin renewal, peelings offer the experienced facial surgeon an almost infinite range of application possibilities. 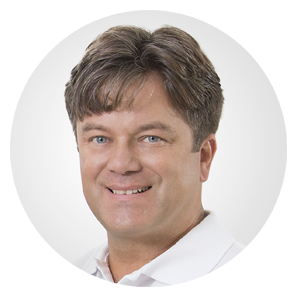 Dr. Muggenthaler learned the method of chemical deep peeling from international luminaries of aesthetic medicine. In 1999, Dr. Baker from Miami trained him in the Baker-Gordon peeling he developed. Afterwards, Dr. Muggenthaler gained experience with the most important subsequent representatives of this technique, the US doctors Dr. Gregory Hetter and Dr. Richard Bensimon. Finally, Dr. Muggenthaler took advantage of his sensational Peeling method with the world-renowned dermatologist Dr. Vigneron from Nice. Who are deep chemical phenol peelings suitable for? 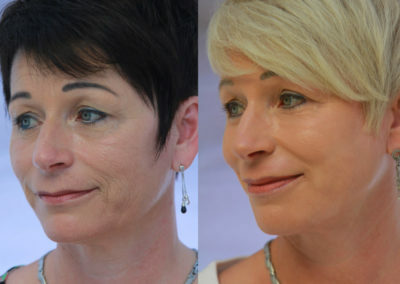 If there is an advanced functional loss of the elastic fibres of the facial skin and there has been a clear formation of medium-deep and deep wrinkles, a deep peeling can achieve almost complete correction. 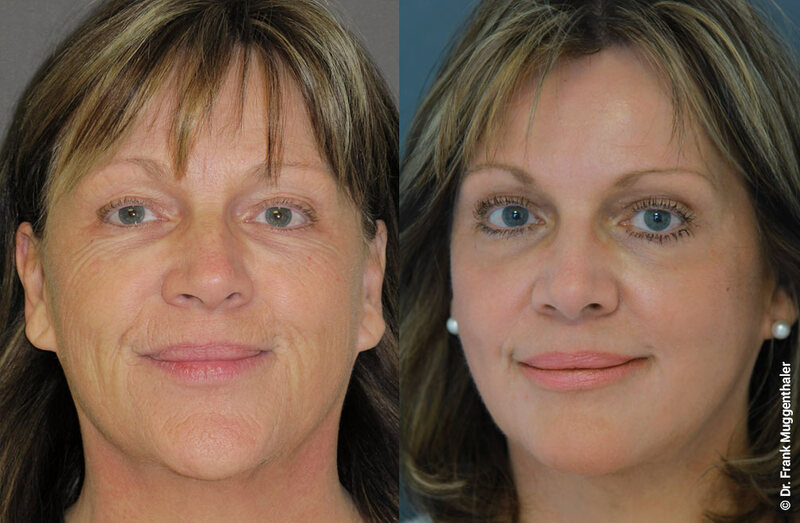 There is no other method, whether surgical lifting or laser treatment, which is similarly effective. Very good results can also be obtained in the presence of cornification disorders (precancerous lesions), pigmentary disorders and (acne) scars. Patients with a very dark skin. If there are inflammatory rashes. If there is insulin-dependent diabetes. In case of impaired cardiac, hepatic or renal function. The occurrence of a herpes infection would be very unpleasant. Endangered patients will definitely receive prophylaxis with appropriate drugs. Otherwise, however, all patients receive appropriate prevention after the procedure. It is reported that cardiac arrhythmias may occur during the peeling procedure. This has not yet happened to us. However, if the heart function or function of the liver and kidneys is impaired, deep chemical phenol peels should not be used. Redness occurs after each peeling treatment. In most cases, they can be well concealed with make-up and disappear after approx. 6 to 8 weeks. In individual cases, however, this may take longer. In rare cases, small or more extensive scars may occur requiring appropriate follow-up treatment. Both pigment loss and overpigmentation can occur as a result of peeling. A slight lightening is almost always observed after a deep chemical peeling and is of course even more noticeable when only individual regions have been treated. Dark pigment changes can occur particularly with slightly tanning skin or dark skin type and then require drug therapy. In very rare cases, the dark pigmentations may be permanent. The preparation of the skin should take place over a period of at least 6 weeks. The actual peeling takes about 90 minutes. The stay in the clinic can be from 1 to 7 nights. Skin redness can last between 6 and 8 weeks, sometimes longer. 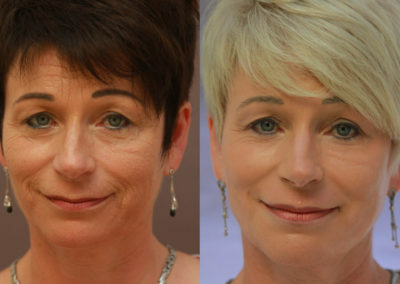 Normally, one application will be enough for a lasting result – a rejuvenation of 10 to 15 years. To keep it that way, you should look after the skin very well and protect it from the sun. Can the treatment be carried out only in individual places, for example on the upper lip? 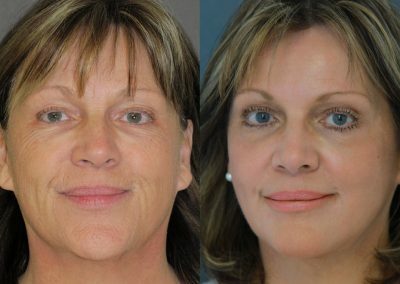 We recommend an isolated treatment of individual regions only in exceptional cases, as redness is otherwise too noticeable. However, we often use different types of face peeling solutions to meet local needs. Can a deep chemical peel be applied to other parts of the body as well? 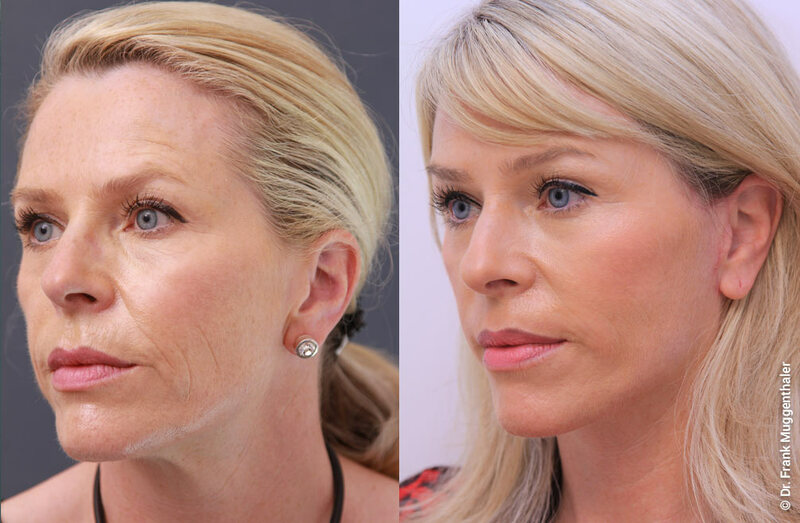 Can a deep chemical peel be combined with a surgical facelift? A complete deep peeling of the face should not be combined with a face lift in one session. The swelling would be just too pronounced. 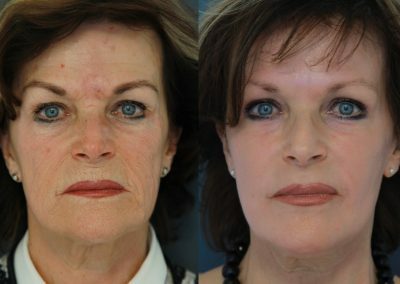 Isolated peelings on the lower eyelids or the mouth region according to a graduated concept can, however, be combined very well with a facelift. We often do treatments in this way. How much younger does one look after a deep chemical phenol peeling? 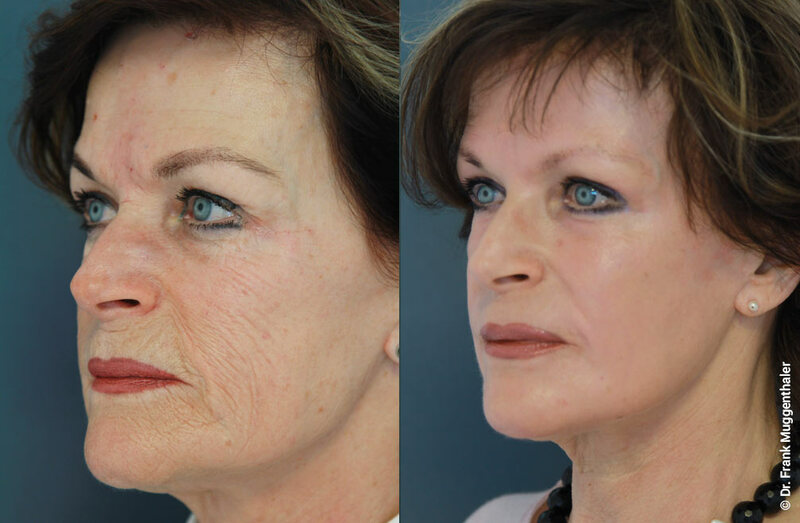 You can achieve a rejuvenation of 10 to 15 years without changing the existing facial harmony. Thanks to local anaesthetics and a mild tranquiliser, the treatment itself is not painful. After that, however, pain can occur for the first approx. 6 hours, which also require the administration of stronger analgesics. In this phase, we use special cooling devices, which cause a significant pain relief. After 24 hours there is practically no more pain. In rare cases, small or more extensive scars may occur requiring appropriate follow-up treatment. Is it forbidden to go into the sun after a deep chemical peel? A good sunscreen is essential in the first three months. Can a deep chemical peel be performed on an outpatient basis or is a hospital stay necessary? Although deep peels are also performed on an outpatient basis, we definitely recommend a hospital stay of at least one night. Many patients stay longer with us, up to 7 days. While on the first night medical care is really important, in the following days it is more about a “hiding” in front of the public. 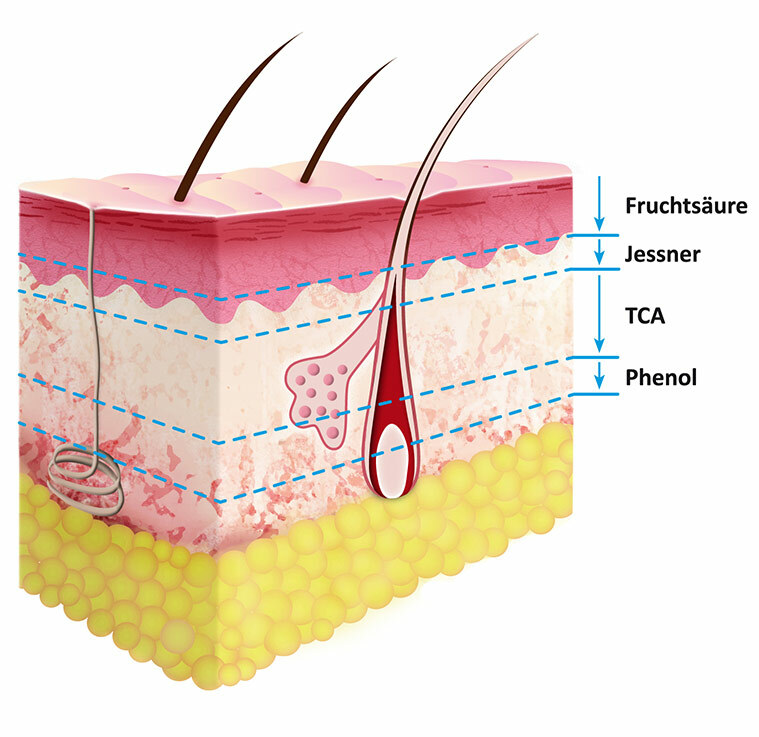 The most frequently asked questions about phenol peeling are answered by Dr. Frank Muggenthaler on this page. Can’t find an answer to your question here? Then get in touch with us! We will answer all your questions, gladly in a personal consultation in our practice in Basel. Dr. Muggenthaler is here for you.